Last month, a blog post I wrote, The #1 Factor That Determines A Toxic or Thriving School Culture, made it to the top of EdWeek’s most-read pieces that week. As thrilling as this was, my heart began sinking as I read some of the comments posted below the piece. Sure, there were a good number that supported my views, and some that respectfully disagreed, offering alternative perspectives and pointing out fairly where my arguments fell short. Most Teacher Leaders start out as, well, teachers. Which means that we’re generally nice, caring people who show up each morning to make a positive difference in our students’ lives. Most of us spend part of our day teaching young people how to get along, and be empathetic toward one another. And when we begin to speak out in broader ways, we do it hoping to make a positive impact and bring people together. As a result, we often find ourselves unprepared to be on the receiving end of someone else’s harsh, personal criticism. And yet, the work we do as teachers, and the opinions we’ve formed in doing this work, are far too valuable to shy away from sharing with the wider community because someone out there isn’t happy with us. We must to find ways to keep sharing, and growing, amidst the flames. Inhale-Exhale-Listen. Whether the person commenting is an anonymous username/avatar or someone you know, the first thing to do is take a deep breath, and try to stay calm. This person has an opinion, a right to express their opinion, and a deep desire to express it. Instead of immediately firing back (which usually makes things worse), or shutting down, try instead to relax and open up. If it’s online, step away from the computer until your adrenaline levels out and you can hear and think more clearly. If you’re in person, responding with lines such as, “I’m listening,” “Tell me more,” or “What else would you like to add?” can show that you’re listening, provide you with some much-needed time to calm down, and disarm you both. Learn, Grow & Keep Going. I must admit, some of the comments on last month’s blog post were spot-on, and made me re-think my message. While I ultimately chose not to respond, I did read every comment, and my own thinking is stronger as a result. As someone who speaks to thousands of educators, parents and students across the country each year, I often get people coming up to me expressing their unhappiness with something I’ve said. I’ve re-thought, tweaked and evolved my message based on many of these comments. Teacher Leaders don’t need to be politicians who can’t change their voting record. We do the best we can with the information we have, and adjust accordingly. 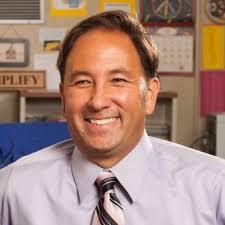 Alex Kajitani is the 2009 California Teacher of the Year, and the author of, Owning It: Proven Strategies for Success in ALL of Your Roles as a Teacher Today, which was named “Recommended Reading” by the U.S. Department of Education. He is a highly sought-after keynote speaker who supports and motivates teachers nationwide. For more, check out www.AlexKajitani.com.